What your looking at is another offering, A fully reconditioned 4.2 Jaguar short motor assembly, this one is actually a 83 S3 engine and will suit any 76 model Series two and after.. but will go into anything with the appropriate mod’s, so if you have a 76 and right through to a 87 Series three car this one will suit you. This one HAS got stepped liners fitted ….. 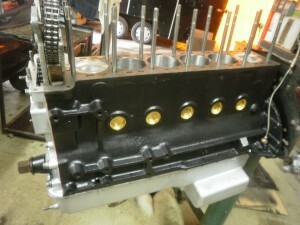 It has new pistons, crank grind, bearings, chains, tensioner, oil pump and end float thrust washers are all fitted. This also has the FANTASTIC “Neoprene rear main seal conversion” done and fitted.